It’s a one-of-a-kind, a tree house built just for youngsters. Children can scramble up the stairs into the house, or play on nets stretched across supports at Sayori Park. The park is not particularly large, but it has been designed as a perfect playground for kids. 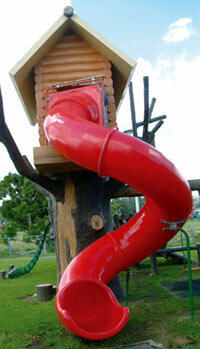 Filled with slides and twisting chutes, the net playground equipment, and even an animal seesaw, it’s a child’s delight. Older kids are not left out either, with facilities for baseball and basketball. Parents can sit in the shaded gazebos watching the scene, or looking across Awase Bay. There are rest room facilities in the park, although no parking. Sayori Park is reached by going straight from Kadena Air Base Gate 2, passing through the Takahara intersection then continuing until the San-A supermarket is on the left and a traffic light directly ahead. Turn left at the traffic light, continue through three more traffic lights, then turn left again. Landmarks should be an Okinawa Soba restaurant and a fishing goods store on the left. Pass them, then turn right and continue to the end of the street. Turn right at the end, and begin having fun.